It doesn’t matter if you have broken jewelry or gold, whatever be the condition of jewelry we are there to buy them. The actual gold content matters to us, whether they are broken necklaces, tangled chains, scrap gold or broken bangles. If you have jewelry that is unwearable and lying with you then its time you take the advantage of skyrocketing gold prices by selling them to a trusted buyer. We pay for the value of gold and not their design. So just reach out to us and we assure you the best rates according to the present market conditions. Gold is worth the same value irrespective of condition in several aspects. 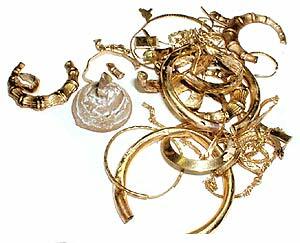 Damaged, tangled or broken gold jewelry owners often seek reliable and honest buyers. Their search end at Unload Your Gold as we always look forward to offer you the best possible prices in exchange. Our experts deal with 8k to 24k or more in gold chains, bracelets, necklaces, earrings, etc. The cash for gold jewelry options are almost unparalleled in this business. Unload Your Gold is a trusted name for converting your scrap gold into a decent amount of money. We strive to meet professional standards and ensure maximum transparency in our dealings. With so many years of combined staff experience, we are a name you can trust. As a full service jewelry buying service, we’ve evolved with the changing times. You’re free to stopover for a free of cost evaluation. Trading the outdated jewelry items for cash is made simpler by Unload Your Gold. We have an expert team of staff for determining the authenticity and purity of such items. It is done with some testing procedures and further explanation of their value through various measurements like weight and recent market value. Life is unforgiving and extremely challenging at times for some people. Circumstances may even come to a point when there is no option but to address a major or small financial crisis. Many people look at old and broken jewelry as a means of fulfilling their needs. Finding the right buyer who offers a decent price amount is again a challenge with many people. We are the first choice of our clients to sell their old jewelry. They also recommend our site to their closed ones and it has positively impacted our growth. There are several online buyers of scrap gold, broken or damaged gold jewelry items. Many of them make claims of offering the highest possible price. However, the instances of those who keep their promises are rarest of rare. Being a company trusted by so many customers, we’d never make promises which aren’t possible to keep. We lay emphasis on maintaining the highest ethical standards in our dealings. You are welcome to meet us with your jewelry items for a free of cost evaluation. We don’t believe in extensive advertising as our clients know what we’re capable of. With a growing list of satisfied customers, we are always trying to improve our service standards.